Lewis, Loftus, and Cocking. Java Software Solutions for AP Computer Science 3rd Edition. Boston, Mass. Addison-Wesley, 2011. Download "Lewis, Loftus, and Cocking. Java Software Solutions for AP Computer Science 3rd Edition. Boston, Mass. Addison-Wesley, 2011." 1 Dear Parent/Guardian: Please find a summary of instructional goals and activities for the class indicated below, in which your student is enrolled. Although what is set forth is subject to change, the general flow of the class should be as written. Please feel free to call me at (323) if you have any questions. Thank you. Course Overview I believe is a very valuable course for students. It enhances students problem-solving and abstraction abilities. They build analytical skills that are valuable in computer science, in other courses, and in life. Of course, students also increase their computer science and programming skills, skills that are needed in an ever-increasing array of college courses and workplaces. The instructional goals and activities of my A course include the course objectives for A as described in the Course Description. This course focuses on an object-oriented approach to problem solving using Java. It includes the study of common algorithms and the use of some of Java s built-in classes and interfaces for basic data structures. I expect all my students to take the A Examination. The students and I work hard during the year to assure that every student has an opportunity to achieve a qualifying score on the exam. Students course grades correlate strongly with how they perform on the AP Examination. Textbook used: Lewis, Loftus, and Cocking. Java Software Solutions for 3rd Edition. Boston, Mass. Addison-Wesley, Roselyn Teukolsky. Barron s A 6th Edition. Hauppauge, New York. Barron s Educational Series, Inc, Abelson, Ledeen, and Lewis. Blown to Bits: Your Life, Liberty, and Happiness After the Digital Explosion. Crawfordsville, Indiana. Addison-Wesley Professional, In order to be successful in this course students must be prepared for class every day. The following are the items the student is expected to bring with him/her on a daily basis: **mechanical pencil or 2 pencils, eraser, paper w/binder Textbooks will be distributed to student to take home. Student must cover textbook. Homework and class work packet: Homework and class work from the previous day will be checked daily. No late assignments will be accepted, except in case of an excused illness. In case of an absence, homework can be turned in a day late. All problems must be completed. 1 problem will be chosen randomly for thorough check. All class work and homework must be kept in binder. Quiz, Tests, Assignments and Exams: There is to be absolutely no discussion during the quiz, test, or exam. Lowest score on the test will be dropped. In the case of cheating, the student will be suspended from this class and receive an automatic 0 on the test, quiz or assignment. Fall Semester 1-2 Computer Systems Numerical representations; limitations of finite representations; number bases and conversion; hardware (primary and secondary memory); programming languages; and language interpreters and compilers. Java Software Solutions, sections 1.0 (Digital Computers and Binary Numbers only), (Main Memory and Secondary Memory ) Exercises: Syntax Index Cards for Java applications. Exercises: Base Conversion and Java Error Messages Worksheets. Lab: Java Software Solutions, Programming Project 1.1. (Implement and test a simple application program.) Lab: Java Software Solutions, Programming Project 1.2. (Test a simple application program after introducing specific errors.) Review: Java Software Solutions, Multiple Choice ; True/False 1.1, 1.5, Test on the Friday of second week 3-4 Objects & Primitive Data Simple data types (int, boolean, double, char); declarations (variable and constant); assignment and arithmetic expressions; console output (System.out.print/println); primitive types vs. objects; using classes to create objects; references; Java library classes (String, Integer, Double, Math, Scanner); and creating random numbers. Java Software Solutions, sections , 2.7 (except Autoboxing), 2.8 (except The Random Class), 2.9; and Summary of Key Concepts Exercises: Syntax Index Cards for types, constants (literals and symbolic), declaration, assignment, and concatenation. Exercises: Declaration, Assignment, and Arithmetic Expression Worksheets. Lab: Pretty Print Implement and test a program to print a table using escape sequences. 2 Lab: Base Convert Implement and test a program to convert numbers from base 10 to 4- digit numbers in a chosen base 2-9 Test on the Friday of fourth week Program Statements Conditional Software Development Process; control flow (sequential and conditional); Boolean expressions, laws, and truth tables; using conditional expressions in if, if-else, and nested if statements; and More operators (increment, decrement, compound assignment). Java Software Solutions, sections ; Summary of Key Concepts Exercises: Syntax Index Cards for if statements. Exercises: Boolean Expression and Decision Making Statement Worksheets. Lab: Java Software Solutions, Programming Project 3.2 Design, implement, and test a program that determines if a given year is a leap year. Lab: Magpie Activities 1-4 (APCS A Labs). Review: Java Software Solutions, Multiple Choice , 3.9, 3.10; Test on the Friday of sixth week Program Statements Iteration Flow of control (iteration); using while and for statements; infinite and nested loops; and analysis of algorithms (informal comparisons of running times and exact calculation of statement execution counts). Java Software Solutions, sections 3.5, 3.7 (expect Iterators and For Loops); Exercises: Syntax Index Cards for while, and for statements. Exercises: Loop Worksheets. Lab: Java Software Solutions, Programming Project 3.6 Design, implement, and test a program to count odd/even/zero digits. Lab: Java Software Solutions, Programming Project 3.10 Design, implement, and test a hilo guessing game program. Lab: Java Software Solutions, Programming Project 3.12 Design, implement, and test a program that prints two-dimensional patterns of asterisks. Lab: Java Software Solutions, Programming Project 3.14 Design, implement, and test a program that plays a Rock Paper Scissors game with the user. Review: Java Software Solutions, Multiple Choice Test on the Friday of ninth week Writing Classes Anatomy of classes, constructors, and methods; declarations (class, interface, instance variable, method, and parameter); method overloading; method decomposition; object relationships; reasoning about programs (assertions, pre- and post-conditions); data abstraction and encapsulation; and designing and implementing a class. 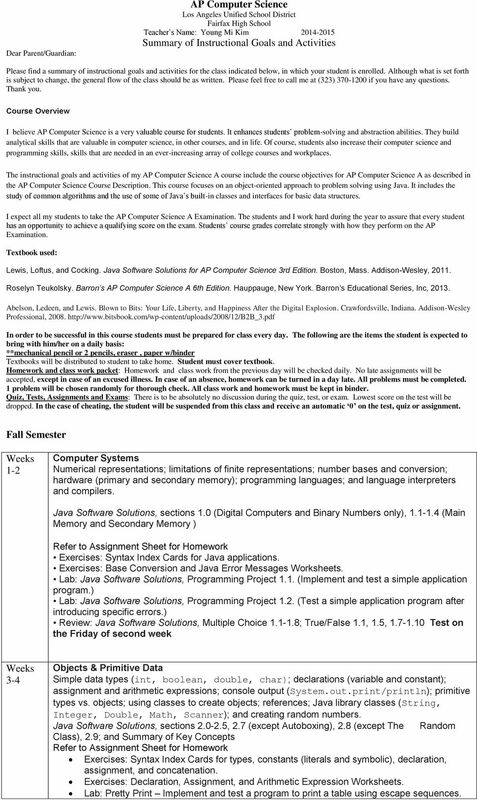 Java Software Solutions, sections Elevens Introduction and Activity 1 (APCS A Labs). Exercises: Syntax Index Cards for classes. Lab: Elevens Activity 1 Card Class (APCS A Labs). Lab: Pongtastic Lab Implement, and test three new classes that complete an OOP Pong game. See edu/2003/pong/ Review: Java Software Solutions, Multiple Choice ; True/False ; AP-Style Multiple Choice Test on the Friday of twelfth week Enhancing Classes References, exceptions, and class design; == vs. equals; object parameter passing; error handling (runtime exceptions, throwing runtime exceptions); interfaces and abstract classes; Java library classes (Comparable and List interfaces) ; and identifying reusable components from existing code using classes and class libraries. Java Software Solutions, sections (except Iterator and List Iterator Interfaces); Summary of Key Concepts Exercises: Parameter Passing Worksheet. 4 1-2 1D Arrays / 2D arrays / Searching Continued One- and two-dimensional arrays (creation, insertions, deletions, traversals, algorithms); searching algorithms and comparison (sequential and binary); and choosing appropriate data representation and algorithms. Java Software Solutions, sections , 6.6; Summary of Key Concepts PictureLab Introduction and Activities 1-9 (APCS A Labs). Lab: Picture Lab Activities 1-9 (APCS A Labs). Review: Java Software Solutions, Multiple Choice , 6.8; True/False ; AP-Style Multiple Choice Test on the Friday of second week Lists / ArrayLists / Selection and Insertion Sorts Lists and ArrayLists (creation, insertions, deletions, traversals, algorithms); sorting algorithms and comparison (selection and insertion) ; and choosing appropriate data representation and algorithms. Java Software Solutions, sections , 6.7; Summary of Key Concepts Elevens Activities 2-4 (APCS A Labs). Exercises: List/ArrayList Worksheets. Lab: Elevens Activities 2-4 Deck Class (APCS A Labs). 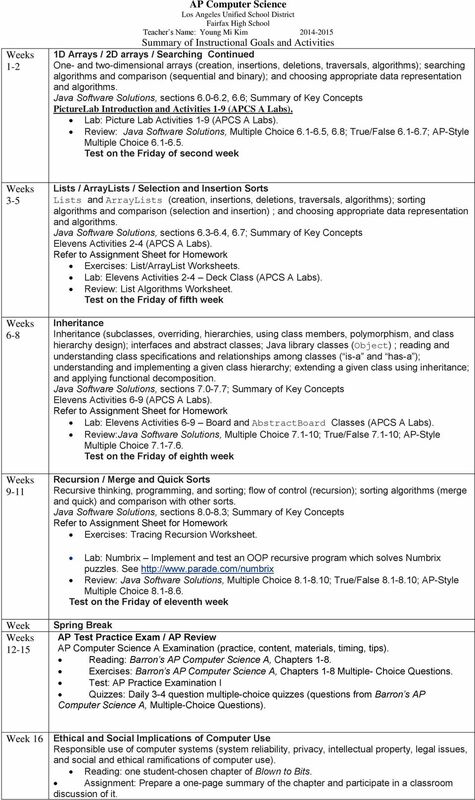 Review: List Algorithms Worksheet. Test on the Friday of fifth week Inheritance Inheritance (subclasses, overriding, hierarchies, using class members, polymorphism, and class hierarchy design); interfaces and abstract classes; Java library classes (Object) ; reading and understanding class specifications and relationships among classes ( is-a and has-a ); understanding and implementing a given class hierarchy; extending a given class using inheritance; and applying functional decomposition. 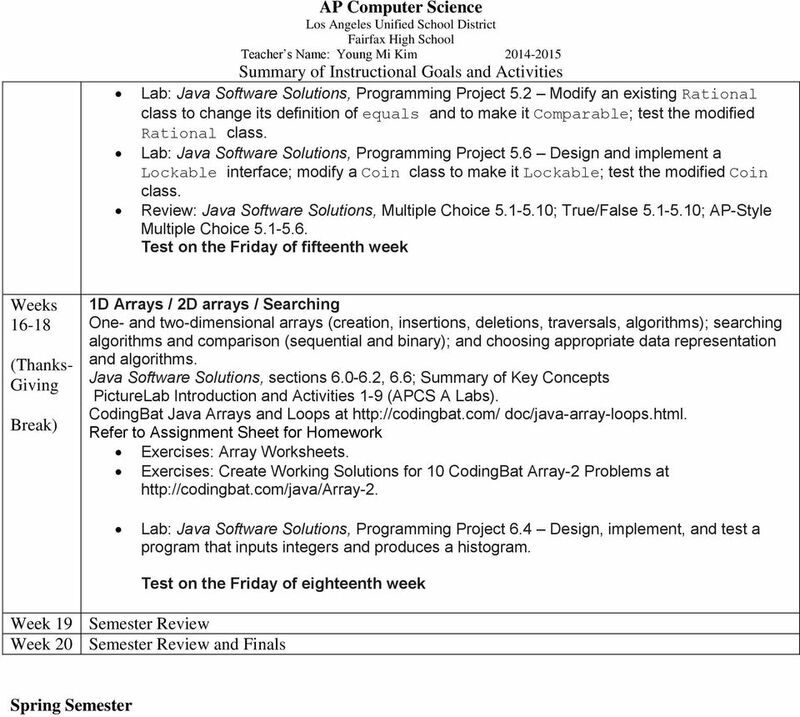 Java Software Solutions, sections ; Summary of Key Concepts Elevens Activities 6-9 (APCS A Labs). Lab: Elevens Activities 6-9 Board and AbstractBoard Classes (APCS A Labs). Review:Java Software Solutions, Multiple Choice ; True/False ; AP-Style Multiple Choice Test on the Friday of eighth week Recursion / Merge and Quick Sorts Recursive thinking, programming, and sorting; flow of control (recursion); sorting algorithms (merge and quick) and comparison with other sorts. Java Software Solutions, sections ; Summary of Key Concepts Exercises: Tracing Recursion Worksheet. Lab: Numbrix Implement and test an OOP recursive program which solves Numbrix puzzles. 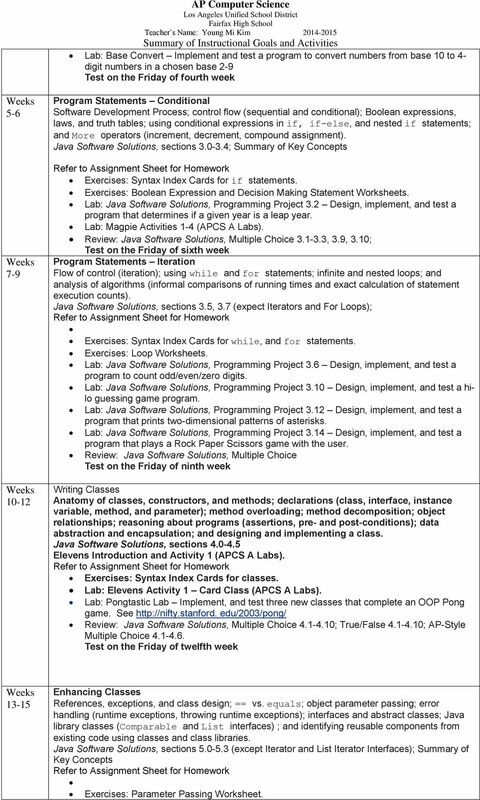 See Review: Java Software Solutions, Multiple Choice ; True/False ; AP-Style Multiple Choice Test on the Friday of eleventh week Week Spring Break AP Test Practice Exam / AP Review A Examination (practice, content, materials, timing, tips). Reading: Barron s A, Chapters 1-8. Exercises: Barron s A, Chapters 1-8 Multiple- Choice Questions. 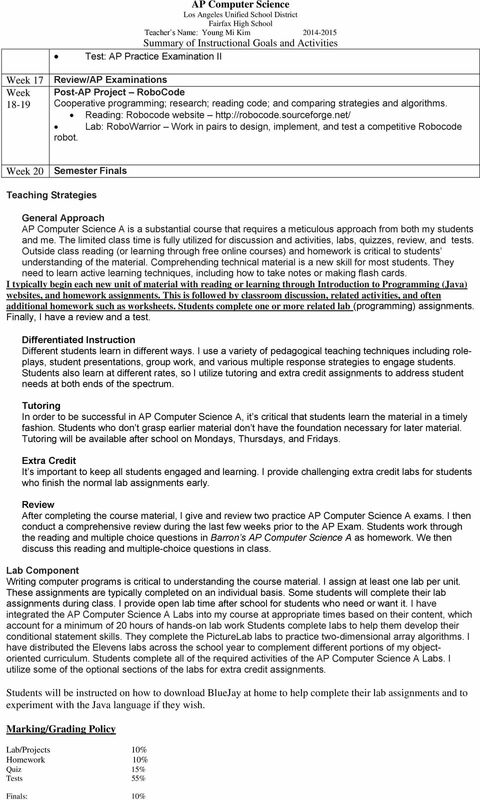 Test: AP Practice Examination I Quizzes: Daily 3-4 question multiple-choice quizzes (questions from Barron s AP Computer Science A, Multiple-Choice Questions). Week 16 Ethical and Social Implications of Computer Use Responsible use of computer systems (system reliability, privacy, intellectual property, legal issues, and social and ethical ramifications of computer use). Reading: one student-chosen chapter of Blown to Bits. Assignment: Prepare a one-page summary of the chapter and participate in a classroom discussion of it. 6 Work habits E: No unexcused tardies, 100% completed homework, consistent preparation for class, at least C average S: Total number of violations of classroom rules or school policies is no more than 3. U: Total number of violations of classroom rules or school policies is more than 3. Cooperation E: No violation of classroom rules or school policies. Work habits mark must be at least satisfactory. S: No more than 3 warnings. U: More than 3 warnings. Make up Policy for Absences: In case of an excused absence, if a student misses a test or a midterm, the student must make up the test the day student returns to school during class. If not, the student will receive a 0 on the test. In case of an unexcused absence, if a student misses a quiz or a midterm, the student will receive a 0 on the test. Tardies: Further, student will lose points for the class work and quiz for the day if the student is tardy. If you have more than 3 tardies, it will be considered a behavior issue and treated as such. CLASS RULES: Students must keep in mind that this class is for the students to learn mathematics and not for socializing. 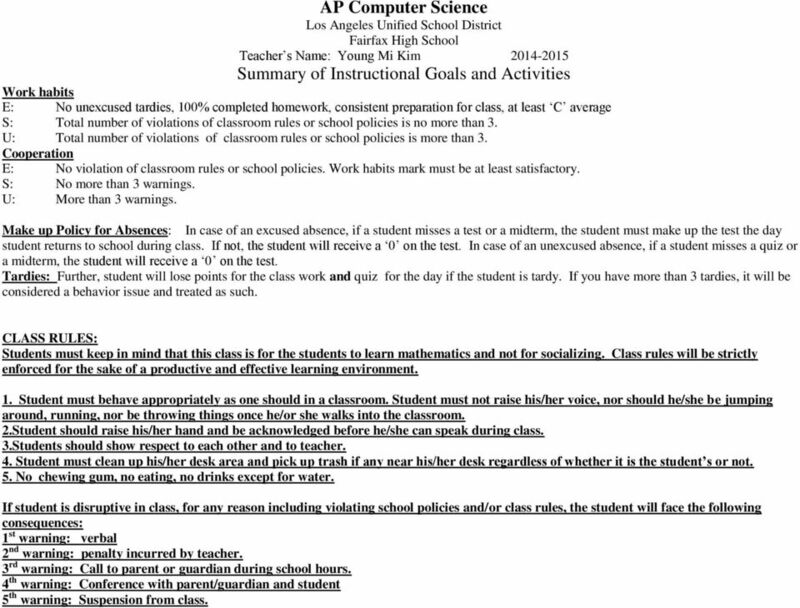 Class rules will be strictly enforced for the sake of a productive and effective learning environment. 1. Student must behave appropriately as one should in a classroom. Student must not raise his/her voice, nor should he/she be jumping around, running, nor be throwing things once he/or she walks into the classroom. 2.Student should raise his/her hand and be acknowledged before he/she can speak during class. 3.Students should show respect to each other and to teacher. 4. Student must clean up his/her desk area and pick up trash if any near his/her desk regardless of whether it is the student s or not. 5. No chewing gum, no eating, no drinks except for water. If student is disruptive in class, for any reason including violating school policies and/or class rules, the student will face the following consequences: 1 st warning: verbal 2 nd warning: penalty incurred by teacher. 3 rd warning: Call to parent or guardian during school hours. 4 th warning: Conference with parent/guardian and student 5 th warning: Suspension from class. Some programming experience in a high-level structured programming language is recommended. COMPUTER SCIENCE A Course Description MAY 2010, MAY 2011 The College Board The College Board is a not-for-profi t membership association whose mission is to connect students to college success and opportunity. AP Computer Science Summer Assignment Due: 1 st day of class, as you walk into the door! Course Title: Software Development Unit: Customer Service Content Standard(s) and Depth of 1. Analyze customer software needs and system requirements to design an information technology-based project plan. Course Information Course Syllabus Fall 2015 Instructor: Dr. Mike Jochen Phone: 570.422.3036 Email: mjochen@esu.edu Office: 337 SCITECH Building Office Hours: Mon/Weds 5:30 7:00 p.m. Tues/Thurs 11 a.m.
El Dorado Union High School District Course of Study Information Page Course Title: ACE Computer Programming II (#495) Rationale: A continuum of courses, including advanced classes in technology is needed. Course Syllabus Fall 2012 Course Information Instructor: Dr. Mike Jochen Phone: 570.422.3036 Email: mjochen@esu.edu Office: 337 SCITECH Building Office Hours: Tues/Thurs 12:45 1:45 p.m. Weds 9:30 a.m.
OPERATIONS MANAGEMENT COURSE OUTLINE MGT 364 Sections 1, 2 and 3 - Glass 438 OBJECTIVES: The objectives of this course include: - Develop a basic understanding of the operations function within an organization.